KLM Royal Dutch Airlines has been widely lauded as a pioneer in social media. Its customer-centric approach means that, for instance, its customers can use messaging to manage many of their flight transactions, from booking to accessing a boarding pass. 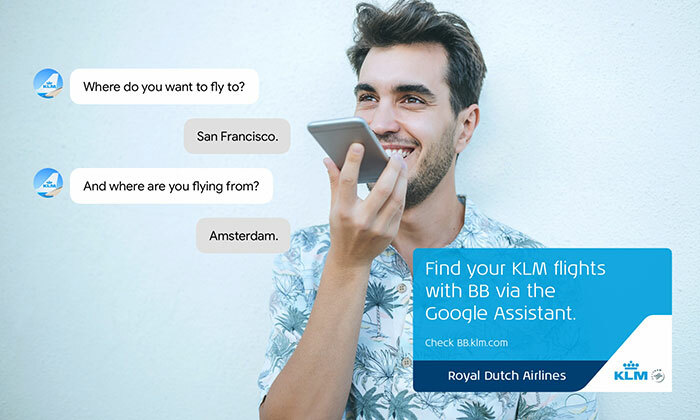 Given that nearly half of all smartphone users across nine countries employ voice at least once a month, according to JWT and Mindshare, KLM has now been experimenting with voice over the last two years. The process of implementing any new channel is iterative so flops and failures are inevitable. Klerks, presenting alongside Jeroen Thissen, Creative Director at KLM’s creative digital agency CODE D'AZUR in Amsterdam, cited KLM Packing Assistant as an early iteration of voice which didn’t work brilliantly but enabled the airline to learn and progress. Another key lesson learned the hard way by KLM was that design needs to have flexibility built in. “Google will do all types of updates that you can’t predict yet,” said Thissen, so voice services need to be able to adapt. KLM’s ambition is to be “the best possible travel companion wherever you are,” according to Klerks, and voice is regarded simply as another platform to provide more services to cover the entire customer journey. Again, the airline is focused on integrating customers’ most frequently asked questions into its services so that BB can answer most queries relatively easy. Customers who are checking how much luggage they can take, for instance, can be helped, but the first question – “how can we help you? – is the most vital for establishing the customer’s intent. KLM and its agencies then design services based on the most common requests. However, without a visual component, certain queries can present difficulties. For instance, questions around baggage can be tricky to solve via voice. Klerks said there’s no one size fits all solution here because baggage allowance is allocated depending on whether or not a customer is affiliated to a KLM loyalty scheme and also on which class they are flying. A visual on the customer can be helpful here as, if the airline can identify them, they can offer clearer advice. “We need to know who you are so we can give personal advice based on your trip,” said Klerks. Lucy Aitken is WARC's Managing Editor – Case Studies.